Italian Alessandro de Marchi rode to a solo win on stage 11 of the Vuelta a Espana as Britain's Simon Yates retained his overall lead. 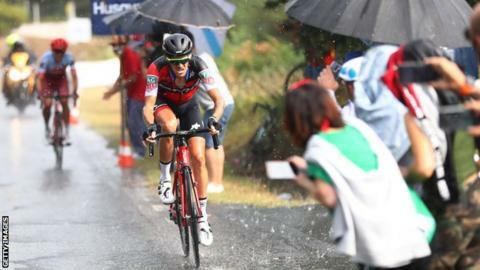 BMC rider De Marchi, 32, pushed clear of Jhonatan Restrepo as heavy rain fell in the final stretches of Wednesday's 207.8km run from Mombuey to Ribeira. Mitchelton-Scott's Yates, 26, finished level with his main rivals to once again defend his red jersey. He maintains a one-second advantage over Movistar's Alejandro Valverde. Spaniard Valverde's team leader Nairo Quintana of Colombia stays third, 14 seconds back. It was De Marchi's first Grand Tour stage win since victory on stage 14 of the 2015 Vuelta, although he helped win a team time trial stage at last year's race. "If I had waited for the sprint, for sure I'd have finished second," said De Marchi, who is known for breakaways and was named the most combative rider at the 2014 Tour de France. "The only option I had was to try everything on the last climb. Honestly, I didn't have my best legs, but it was just in the head. At one moment today I just said that I just had to keep trying because it was a real battle." Thursday's 12th stage is a 177.5km hilly ride from Mondonedo to Punta de Estaca de Bares in Galicia.